The intention of the book is to highlight the development of a type of football organisation that falls outside of the well documented elite professional game, the most recognizable face of the sport. 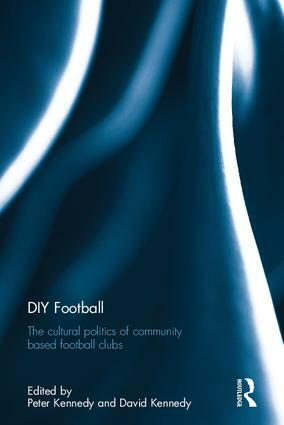 Specifically, the focus here will fall upon community based football clubs which have grown out of the grassroots game. Well known examples of these clubs in Britain are the Bristol organisation, Easton Cowboys and Cowgirls, and the Leeds based Republica Internationale – both of these clubs have forged links with similarly motivated organisations in other countries who regularly come together in tournaments to express solidarity. Collectively, these clubs have sometimes been referred to as forming a ‘DIY culture’ in football. Their defining characteristics being variously described as anti-commercial, democratically constituted, advocating social responsibility and inclusiveness, and holding an outlook of solidarity that, in some cases, involves political education. This book was originally published as a special issue of Sport in Society. David Kennedy is currently a freelance researcher, with research interests in the history and political economy of football. Peter Kennedy is currently a freelance researcher, with research interests in football, sport and Marxist political economy. He is an associate member of the Socialist Theory and Movement Network, Glasgow University.